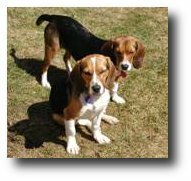 SOS Beagle Rescue, Inc. has three chapters, and our dogs are listed by chapter. All of our beagles are spayed/neutered, microchipped, up to date on vaccinations, and on heartworm preventative, prior to adoption. If you see a beagle that you are interested in, please read over these guidelines and submit an application. Please keep in mind that you must be willing to travel to meet both us and the dog!! We cannot guarantee any dog's availability since there is often a waiting list of pre-approved adopters for incoming dogs. If you are interested in adopting, we encourage you to submit an application to get the process started. All current pets must be up to date on shots and heartworm preventative. We have no reason to believe that our dog will be given better vet care than those already in your possession, and we've spent time and money to be sure our dogs are healthy when adopted. We will not risk that required follow-up care will be neglected. Applicants with children 8 years of age or younger, with no recent dog ownership, are required to have a fenced-in yard. Occasional exceptions are made if there is a history of recent beagle ownership. All of our beagles are spayed/neutered, microchipped, up to date on vaccinations, and on heartworm preventative. All adoptions require a personal visit by all family members residing in the home -- we do not ship our dogs to their new homes. An adoption fee of $180 is required at time of adoption, payable in cash or money order. (We have regrettably had to discontinue the acceptance of personal checks.) This partially reimburses us for the cost of your dog's spay/neuter, shots, heartworm test (and treatment, if necessary), microchip, and other expenses. Occasional special needs or senior dogs may qualify for a reduction in the adoption fee. Please have the courtesy to call us and cancel your application if you find a dog elsewhere. We are volunteers, work full-time, have families and pets of our own, and our time and resources are just as precious to us and the dogs we are trying to help, as they are to you. Please consider adopting an older beagle. Or you could even adopt a pair of beagles. © 1991 - 2019 SOS Beagle Rescue, Inc.